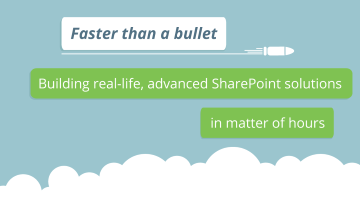 Faster than a bullet: Building real-life, advanced SharePoint solutions, in matter of hours. The skybow webinar from March 23th was about building real-life, advanced SharePoint solutions, in matter of hours. Christoph from Germany was asking if Solution Studio Online is hosted by skybow? Yes, Solution Studio Online is hosed in our Azure environment, but the Solution Builder is hosted in your own Office 365 site as you can see by the URL. In the URL, you can see that the solution is in a hidden list called sbSolutionStudio where everything is, and for aggregation and background calculations we use webhooks. There is one exception where we use a provider hosted app, because this is an important question. Your data never leaves SharePoint, but there is a current issue with webhooks, it can take a few minutes for webhooks to fire. Most of the time that is ok, since most calculations are not time critical, but there we have an option called “reduce calculations”, and there we have an provider hosted app that overtakes the calculation that provides a signal to our provider hosted app hosted in our Azure environment. Again, it’s not the data but a signal and it’s something you need to turn on, and it’s not by default turned on. By default we use webhooks are used for calculated values and webhooks are always executed in the context of your SharePoint page and not of any provider hosted app. Ricardo from Germany was asking if there is a possibility to blend in the "My task" part on the left side as well in the on premises Skybow solutions studio? Solution Studio on premises and Solution Studio Online are complete different products, but the action links shown in here can be created as well with the on premises version. Action Links can be used as a separate add-in for on premises environment as well if the app infrastructure is activated, it’s called skybow action links. Marco from Germany was asking if there is a way of packaging a built solutions? So I can deploy a solution to a different tenant? This is what we are working on now, and will be available soon via our future updates. It will be possible to develop an application on one tenant, and deploy it to several online tenants, and we will be supporting the whole Application Lifecycle Management, including updates and solution branching. This will come in the next few weeks with a basic version, and will grow out over time into a full suite. Steen from Denmark was asking if we can say a little bit how packaging will work? For example will it be possible to package dossiers separately? In the first release we will only package what is configured in Solution Studio Online. If you have additional lists, they will not be packaged, but everything that is configured, like Forms, Actions, list search, the Dossier and lists with fields, but it won’t yet be possible to specify what you want to package and what not in the first release. Clarinus from the Netherlands said: Thanks. I just wanted to get a quick overview. I will dive deeper in skybow and see if we can (are allowed) to use this. Yes, you can, everyone can create an account on http://my.skybow.com and start building applications, for one person it is free. Malte from Germany was asking if they can also use this for on premises? Unfortunately not yet. Solution Studio Online is only for SharePoint Online at the moment. Building a solution will always be online, but there are plans to make deploy possible to on prem. For on premises we still have our on premises version (full-trust code) available, that has even more features than what we can offer online, and it is possible to use Rich Forms, Link Actions and our other add-ins in an on premises environment when you have the App infrastructure in place. Malte from Germany was asking as well if they can create those nice bar graph diagrams or similar things with the on premises solution as well? Adis said that is no longer dependent to Power BI features, cause that is now a standard SharePoint webpart? Did I get that right? Not yet, because with Google Charts you have probably no access to your on premises data. But when Microsoft brings the PowerBI and SharePoint Framework stuff as an update for SharePoint Server, it will become possible. Q from the Netherlands via mail: can you add a toolbar on a popup form when the toolbar is off? A: If you decide to switch off the ribbon bar in the Solution Studio Online, you can add the custom buttons positioned beside each other to implement the functionality you need, such as saving forms, setting fields, running workflows etcetera. Of course, you can always bring the ribbon bar back from the solution studio, if you decide so. Q from the Netherlands via mail: solutions are now building on SharePoint lists.. why not build with a azure sql server as background? A: SharePoint has been since more than a decade a platform for building business solutions, and we in skybow are building on this, making the solution builder’s life easier. We might in the future include additional data sources, including Azure SQL Server, Tables and Blob, but there is no strictly decided timeframe on this.